We live in a time where we can function 24/7 if we have to. But with this increased productivity, some essential activities are sacrificed, foremost of which is sleep. We take the simple pleasure of a good, superior sleep for granted. We need to have adequate sleep, that much can’t be emphasized enough. Sleep loss can have drastic effects on a healthy lifestyle; it will have an impact on your heart, weight, mind and well-being. Insufficient sleep will lead to serious, long-term health problems, such as heart disease, strokes, diabetes, obesity and rational thinking. But through the untiring efforts of Uratex, a large number of Filipino families and individuals now sleep better. Because of these innovations, we have become healthier, more productive and energized during the day. Nothing understands this fundamental need for better sleep than Uratex. As the undisputed “Sleep Specialist,” Uratex continues to innovate and revolutionize the way it gives a superior sleeping experience to Filipinos through its latest collection, the Sleep Revolution. “With Uratex, you get the best sleep. Everyone at our company takes great pride in making sure that each mattress we manufacture delivers superior comfort and support to improve your quality of sleep. Today, we will offer innovative products that will deliver on this promise,” says Cherry Wong-Tan, Marketing Director of Uratex. The Sleep Revolution is the future of sleep. The new collection focuses on Premium Touch Romance, Senso Memory Ultima Plus, Orthocare Biorytmic and Perfect Serenity Aura Fresh. It not only gives better sleep, but also responds to specific needs of different sleep problems Filipinos usually encounter. Keeping the flames of love alive doesn’t have to stop after a long, hard day. The Premium Touch Romance is all about inspiring passion and desire for you and your significant other. The secret lies on its mattress ticking infused with the essences of ginseng, ylang-ylang and cinnamon, giving it a sweet and spiced romantic ambiance. Its unique perfume micro-capsules have a long-lasting effect to inspire a more intimate bond for couples. Crafted with Smart Reflex® Pocket Spring System that intelligently isolates body movement for an undisturbed sleep. Additionally, its combines the best of both worlds: Natural latex and Senso Memory foam for a superior sleep experience. 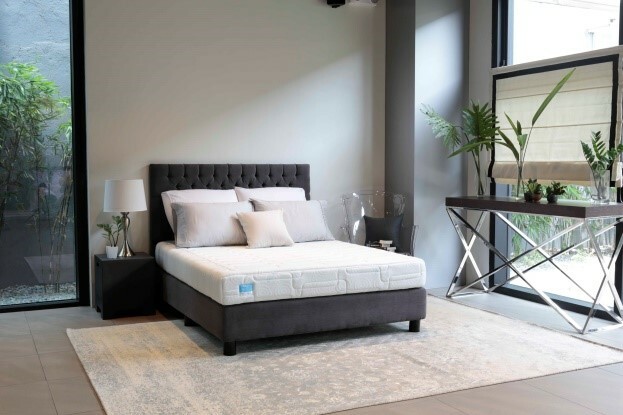 The Orthocare Biorytmic mattress uses advanced sleep technology using rejuvenating minerals responsible for restoring energy and regulating the body’s biorhythm. As you sleep, it helps reduce stress and provides better balance and concentration. For outstanding pressure relief and back support, it is coupled with Orthofirm® foam for a firm comfort feel all night long. For a refreshingly cool sleep, look no further! The Senso Memory Ultima Plus is specially designed with a cooling technology that helps you fall asleep faster. What sets it apart from others is that its memory foam is blended with Hydragel® beads that absorbs heat. Wrapped with Cooler® knit fabric, it provides an enhanced cooling effect and has been proven to lower body temperature by up to 2°C. Furthermore, its plush comfort layers delicately adjust to your body’s movements while you sleep, relieving you from painful pressure points. Always worried about odors in your bed? The Perfect Serenity Aura Fresh is the solution to your problem. This innovative mattress has odor-repelling qualities that offer a fresh, clean sleeping environment. For long-lasting odor-free protection, its cover is formulated with complex compounds that effectively eliminate all unwanted odors from the body so your mattress smells fresh while you sleep. It features a convoluted high-resilient foam with an egg crate design that allows air to flow freely. Balancing the body’s biorhythm is essential as it improves your intra-body communication and promotes your overall well-being. Uratex Premium also offers innovative pillows equipped with the same sleep technologies to complement these mattresses. The cores of Perfect Serenity Aura Fresh, Orthocare Biorytmic and Premium Touch Romance pillows are made of supersoft molded foam built for plush comfort while the Senso Memory Ultima Plus pillow’s core is made of Senso Memory foam with Hydragel® beads. Both mattresses and pillows are treated with Sanitized® that effectively protect against growth of bacteria, odor, mildew and dust mites. The latest Uratex Premium Mattress Collections are available at Our Home. Our Home is the country’s top lifestyle furniture store chain; with 24 stores in major SM malls nationwide. 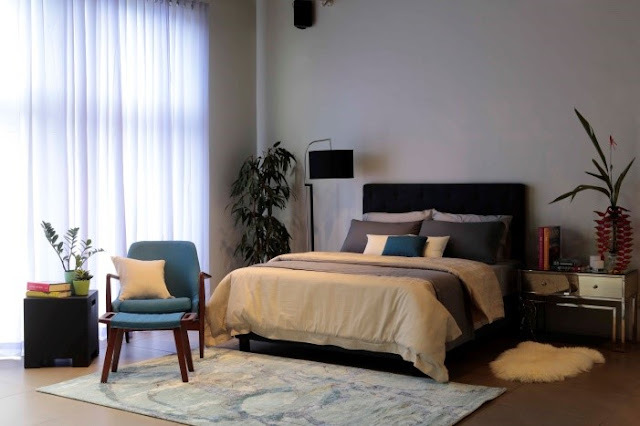 The company’s philosophy has remained consistent — to provide customers with trendy, chic and affordable luxury furniture as well as superb service. Our Home offers a wide array of contemporary furniture, decor and home accessories that are of high quality at affordable prices. “Since we were founded in 1968, our Mission remains the same: To be the customer’s choice, with products and services that can be relied upon and depended on. Our Vision is also unwavering: We intend to satisfy customers through quality products that are competitively priced, delivered on time, and developed through close coordination with our customers. As our founder, Robert G. Cheng, declared, ‘We will not stop until we give every Filipino a comfortable and affordable mattress to lie on,” said Mrs. Naty Cheng, CEO and President, RGC Group of Companies. 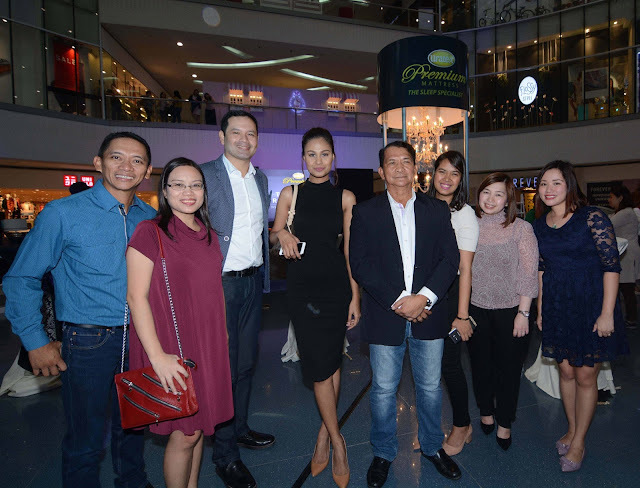 Uratex Executives and Managers enjoy the company of special guest Venus Raj crowned 4th Runner-up Miss Universe 2010 during the Sleep Revolution launch event. With her (from left) are Edwin Gallor, Director of Uratex Automotive Group, Marvey Alcantara, Uratex Consumer-Marketing Manager, Dindo Medina, Uratex Sales Director, Eddie Gallor, President of RGC Group of Companies, Love Sacluti, Uratex Brand Manager, Cherry Tan, Uratex Marketing Director and Meg Rosello, Uratex Marketing-Copy Editor.